Sunday, March 7, 2010, 9:00 a.m. to 5:00 p.m.
23 Sandy is pleased to announce a flag book workshop with Chicago book artist Karen Hanmer. 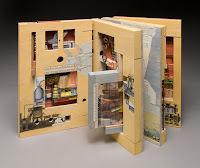 Karen will have a show in the gallery in March and while she is here we thought we should have her show us this wildly popular, kinetic book binding structure that was invented by Hedi Kyle. This is going to be a fun one, please join us! Complete information about this workshop and registration can be found here. 23 Sandy will very excited to host New Directions: Down + Out, the annual juried photography show from wall space gallery in Seattle. This exciting show will hang here at 23 Sandy in February following it’s Seattle premier in January. This year’s juror, Carol McCusker, Curator of Photography at the Museum of Photographic Arts (MoPA) in San Diego, was seeking photographs presenting two points of view: looking down from a high vantage point, and looking out to a vanishing horizon. Congratulations to the 42 photographers who were accepted into the show including four from Portland: Chris Bennett, Heidi Bertman, Jeffrey Krolick and Duc Ly. The show will also feature a strong international contingent, including artists from Mexico, England, Israel and Argentina. Check out the entire roster of artists and a few more images here at wall space’s blog. We would like to wish you a Merry Christmas and share a view only seen by Santa this time of year. North IV (Noon), a color photograph by artist Jennifer Schlessinger, is one of the featured images for our February show New Directions: Down and Out. New Directions, the annual juried photography show at wall space gallery in Seattle, seeks to discover new talent in the world of photography. 23 Sandy is very pleased to host the fourth annual New Directions in February after its Seattle premier. This year’s juror is Carol McCusker, PhD, Curator of Photography at the Museum of Photographic Arts (MoPA) in San Diego. 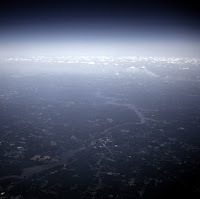 The photographs will present two points of view: looking down from a high vantage point, and looking out to a vanishing horizon. 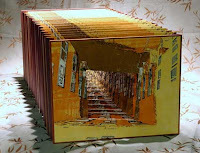 New Directions: Down and Out will be our first exhibit of the new year, scheduled for February 4-27, 2010. Be sure to check back for more information on this upcoming exhibit. And, just like last year the gallery will be closed for winter break from January 10th through February 3rd. 23 Sandy Gallery will be open on December 24 for last minute shopping or a relaxing browse before the big day! We will also be open our regular hours on New Years Eve. The Gallery will be closed on December 25, 2009 and January 1, 2010. Please also note that January’s First Thursday and Friday will be held on Second Thursday and Friday due to the holiday. 23 Sandy will feature a closing reception and awards ceremony for our current exhibit, The Assignment, on Friday, January 8 from 5:00-8:00 p.m. Please join us for the festivities. We are also open late on Thursday, January 7. Be on the lookout for info on our upcoming February exhibit, New Directions: Down and Out. T-BAG (Thursday Book Arts Gathering) is a group of Portland-area book artists, who meet the third Thursday of each month. It’s an opportunity to meet other book artists, see their studios and their work. Everyone is invited to join us for this casual monthly event. Feel free to bring some of your own recent work (completed or in progress), to share with the group as this is also a good opportunity to show off and get valuable feedback. There are no minutes, agendas or dues, just great company and art. All who work with books or in the book arts are invited. This month 23 Sandy is hosting the group in the gallery. We’ll meet at 6:30 pm on Thursday, December 17, 2009. (We will get back to our usual 7:00 pm start time in January!) The current exhibit is The Assignment, a juried show organized in conjunction with the College Book Art Association (CBAA). It’s a chance not only to see some great books, but also to feed your brain with the assignments, parameters and jumping-off places that inspired them. We also want to see what you’ve been up to, so please bring your own work and ideas to share with the group.23 Sandy Gallery is at 623 NE 23rd Ave, three doors north of Sandy Boulevard. More info and a map to the gallery here. To stay informed of T-BAG and other book arts events in the Pacific Northwest you should join the NWBookArtsList at: www.groups.yahoo.com/group/NWBookArtsList. Remember, T-BAG meetings and events are only announced on the NWBookArtsList. No other emails or invitations are sent out. So, if you want to join us, join the list! T-BAG is sponsored by the NW chapter of the Guild of Bookworkers. The current Guild of Book Workers (GBW) national exhibit, Marking Time, opened in Minneapolis this May, and is currently touring the country. For those of you who have been patiently waiting for it to arrive here in the Pacific Northwest, your wait is over! The exhibit has finally opened at the Suzzallo/Allen Library at the University of Washington, in Seattle. Marking Time will be on display through February 19, 2010. The books will be displayed in three separate locations within the Suzzallo/Allen Library. Through January 6, only two parts of the exhibition will be open. Between January 6 and February 19, all three parts of the exhibition will be on display. Please note that the Special Collections Lobby exhibition space has shorter hours than the Suzzallo/Allen Library and is not open on Saturdays. Be sure to check the exact hours and exhibition schedule by clicking here. If you’re not familiar with the University of Washington campus, the Library website provides a map and other information. Several of our favorite gallery artists are featured in the Marking Time exhibit. Click here to see their work in the show. You can also click on the names below to see their work that we carry in the gallery. Or better yet, stop by the gallery and take a look. Congratulations to all of our local and gallery artists who are featured in this very important exhibition. 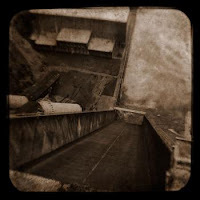 Image credit: A Short Course in Recollection by our very own Sue Collard. At 23 Sandy we are thrilled to call Mary V. Marsh one of our regulars. We have recently received Marsh’s latest artist book, Everyday Reader. Marsh brings new life to old books by using library discards to create her unique works. In Everyday Readers, drawings of people reading—sketched during Marsh’s daily commute—are translated into block prints and printed on discarded library cards and newspapers. In different postures of concentration, they are creating a mental space for themselves, an escape, or just making time pass. The visceral materials, the nostalgia of the old cards and newspapers, suggest expiring mediums and a history of the changing methods of reading. Everyday Readers, is a series of prints and a new open edition artist book. Block prints on library checkout cards are combined and bound in pamphlet format and finished with a unique vintage book cover. A native of Beaverton, now residing in San Francisco, Mary has shown her artist books at our Beautiful Book exhibition this past June and we love offering her work at the Gallery. To see Marsh’s online catalog click here. Book artist and printmaker, Julie Chen of Berkeley, California was first drawn to the book arts after receiving her degree in printmaking. She entered the book arts program at Mills College in 1984 and from there things have never been the same. Chen became an associate professor and has been teaching at Mills since 1996. For over twenty years, she has published limited edition artist books at Flying Fish Press<?xml:namespace prefix = o />, a print house she established in 1987, in Berkeley. Julie Chen was featured in Craft in America, a PBS television series, this past October. Today, Chen’s books are considered exceptional for their craft and quality. She regularly gives lectures on bookmaking and teaches workshops in cities across the nation, including Oregon College of Arts and Crafts in Portland, Oregon. When you come in to see The Assignment , be sure to take a close look at Chen’s piece, Personal Topology. Her books are in very high demand, and this is a great opportunity to own a one-of-a-kind book by this very popular and inspiring artist. <?xml:namespace prefix = o ns = "urn:schemas-microsoft-com:office:office" />23 Sandy Gallery and the College Book Art Association (CBAA) are pleased to present The Assignment, a national, juried book arts exhibition held in conjunction with the annual meeting of the CBAA in Portland, Oregon. To illuminate the meeting’s focus on book arts teaching practice and pedagogy, this exhibition features artist book works that were generated directly from course assignments or from self-assignments generated by the artist. Please join us for our artist reception on First Friday, December 4, 2009, 5:00-8:00 p.m. and for our closing reception on Friday, January 8, 2010 from 5:00-8:00 p.m. During our closing reception, one book will be awarded the “Purchase Prize” and will be purchased and donated to the John Wilson Special Collection Room at the Multnomah County Library in Portland. In addition, the CBAA will give cash awards and several honorary awards.The CBAA meeting attendees, many of whom will be featured in the show will be here for the closing reception. We are also open during First Thursday, December 3, 2009, from 5:00-8:00 p.m. We invite you to join us for any, or all three, of these exciting evenings. The Assignment was juried by Macy Chadwick and Clifton Meador. Macy Chadwick is an instructor at Academy of Art University in San Francisco, the San Francisco Art Institute, and the San Francisco Center for the Book. She is also the proprietress of In Cahoots Press, Oakland, California. Clifton Meador is associate professor and director of the M.F.A. program in book and paper at Columbia College in Chicago. He is also the editor of the Journal of Artist Books. 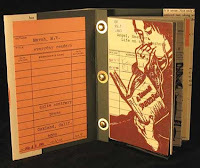 The College Book Art Association is a non-profit organization fundamentally committed to the teaching of book arts at the college and university level, while supporting such education at all levels, concerned with both the practice and the analysis of the medium. The Association aims to engage in a continuing reappraisal of the nature and meaning of the teaching of book arts. The annual meeting to be held in Portland January 8-9, 2010. In the meantime, enjoy this mini peek at these Assignment submissions. Fairyland, by Leilei Gou, comes to us from Bejing, China. Gou states, ” My idea of this work comes from my grandfather’s home, which is a very old style building in Beijing. There is a huge space in the center of the building, all the apartments are around this space, so when you are on the first floor (ground) you could see the sky through this space, and if you are on the top of the building, you look down could see what happens in the ground.” This silkscreen tunnel book is gorgeous and intriguing. Angela Early of Brooklyn, New York offers Many Stories in Just Six Words #5 . 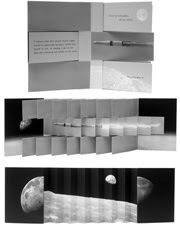 Early’s accordion book contains portions of everyday conversations which, according to Early, “…include powerful statements that have universal and infinite meaning. My goal in creating these relief printed accordion books was to make these statements visible, tangible, and accessible. I limited my stories to just six words in order to edit the endless possibilities.” Bold graphics + minimal text = big impact. To view the complete online catalog click here. All images and text copyright the artists and authors. All rights reserved.